At long last I can share with you some news on our GRRM A Song of Ice and Fire book license. 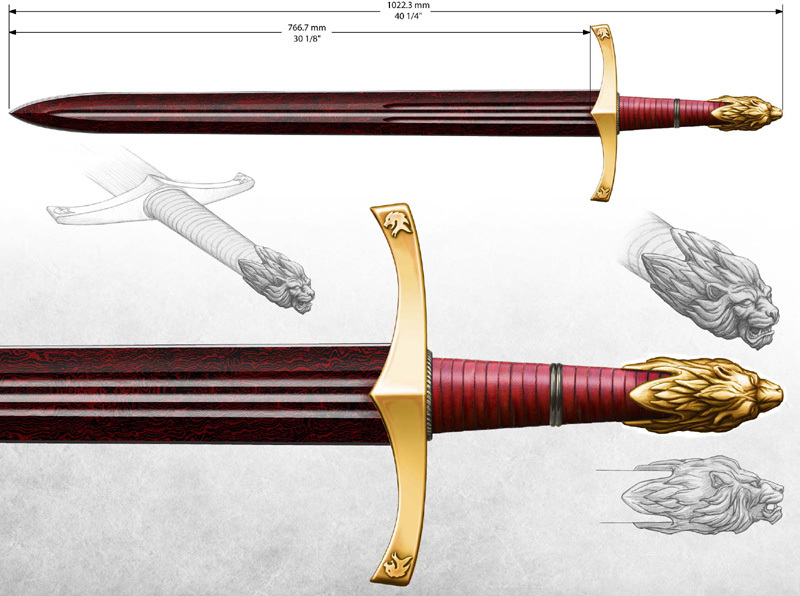 We have new approved concept art, it took awhile, but here is Oathkeeper. Again, this was designed working with George R.R. 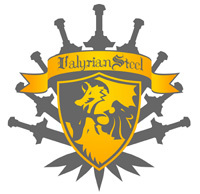 Martin through our book license, it is not a replica of Oathkeeper as see on the HBO show. George did not want to use paint and the only way we know to do the red and black blade is with a chemical patina on real damascus, so our intention here is to make only a real damascus version of this sword, there will not be a plain steel version. We also intend to include a custom poster featuring artwork the includes the sword, along with the typical GRRM autographed COA. At this point preorders will not be opening soon, this is just the first step. Expect preorders possibly late Winter 2015, and deliveries around a year from now, assuming we get the prototype in and everyone is happy with it. We also got approved concept art for Daario’s ladies on the book license, which will be shared with you soon. This sword looks amazing. I have been quite anxious for this book version. The red pattern looks magnificent. Very similar to what I imagined for Martin’s description. I cannot wait for this sword. Just got out of my first surgery since being diagnosed with cancer and this is the perfect thing to cheer me up. I’m going to start saving up for its release now. Keep up the great work. You guys are awesome! It looks spectacular, I’ve been waiting for this for ages!!!! This looks amazing so far, great job VS! Awesome! Really looking forward to seeing this on my wall with all the others. Will there be a widow’s wail? Uh was that a Typo? If Pre-Orders start in Winter of 2015 then delivery wouldn’t be until a year from then being Winter 2016? I’m totally stoked for this, but I really hope I don’t have to wait 2 years to see it, lol. Been waiting a long time for this beauty. If the sword comes out as good as or better than the concept art, then it will be an amazing addition to my collection. It looks exactly as I imagined it, simply beautiful! Can’t wait to see the final product! Would it be possible to give a price range? And will it be made a full tang? Did you mean deliveries two years from now? If not then preorders next Winter would not make sense. Amazing!! I have been waiting for a while as well. Can’t wait to see the concept art for the Ladies. Both will be added to my collection once available. Great news, great news! Well after looking forward to Oathkeeper for some time, I must say I’m disappointed with this concept. I was thinking about getting the HBO Oathkeeper but then I seen this. It is beautiful and it will be worth the wait. I will be preordering this the second I am able to. I can’t wait for this one! Still looks great every time I visit this page. Is there an updated timeframe on when pre-orders may start? The original article above said Late Winter 2015…we’re now into Spring and getting close to Summer 2015. Does anybody know if this will see a similar price tag as Ice and LongClaw or is this one going to be quite a bit more because of the colour? Where do I sign up? I want the new (red colour) oathkeeper. Please notify me the instant that I can order one!! Any updates on this awesome-looking piece?